Conducting business in an entrepreneurial way and having the capacity for innovation are the most important competitive factors in many business sectors today. To this end, the Austrian-born economist, Joseph Schumpeter, created the term "creative destruction": The stronger incessantly pushes the weaker. The existing economic structure is altered through innovation. Companies failing to rise to this challenge disappear from the market place. However, anyone determining the rules of the game as an innovator, not only generates wealth and social benefits, but may also achieve a temporary monopoly profit. Innovations are not just the rare, trailblazing "break-throughs". Value is alos generated from companies by creative product improvements, altered processes, new markets and more intelligent organizational syltes. Entrepreneurial opportunities are constantly arising in technologies and markets, and many ideas are just waiting for their commercial implementation. The ability to make use of them will become a key qualification for executives and managers. It is particularly at the interface between economics and technology that there lies a great deal of unexplored potential. 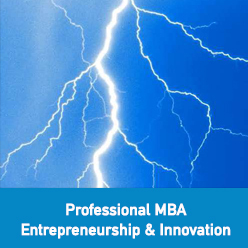 The Professional MBA Entrepreneurship & Innovation provides the appropriate skills and techniques, and thereby teaches entrepreneurial thinking and acting. The lecturers are internationally renowned experts. The organizer TU Wien represents the link between technological excellence and business competence. This Professional MBA is an important step in the transfer of cutting-edge knowledge and management skills at the highest international level. In this program, innovation is understood as the process through which knowledge and creativity lead to product or service changes. Entrepreneurship is then the process through which knowledge and creativity generate new ways of delivering these products and services, either through a new organization or through reformation of an existing enterprise. In the second year, the professional specialization and immersion in the subject matter take place. The final part of the MBA Program serves for the consolidation and integration of what has been learned, as well as the writing of a practically-orientated Master's Thesis. Visit the Professional MBA Entrepreneurship & Innovation page on the Vienna University of Technology website for more details!